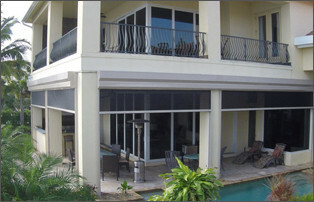 If you are looking for the best roll down hurricane shutter company in Naples, Florida, look no further than Storm Guard Solutions. 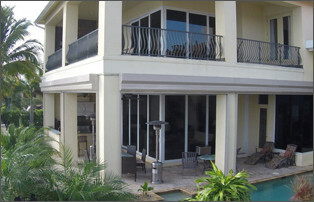 Storm Guard Solutions has been installing and maintaining roll down hurricane shutters in Naples since 2004. Considered one of the finest places to live in the Sunshine State, Naples is known for its beautiful weather, pristine beaches, beautiful homes, upscale shopping and championship golf courses. It is also subject to intense storms and hurricanes. Ensure you, your family and your property are protected. From Gordon Drive and Pine Ridge Road to Immokalee Road, Logan Blvd and Collier Blvd, we have helped thousands of homeowners and businesses obtain the hurricane protection they desire at aa price they can afford. Living in South Florida, it’s not a question of IF we will be subjected to intense storms or hurricanes, it’s more a question of WHEN. Aluminum Roll Down Shutters are custom built by the experts at Storm Guard Solutions and come in a variety of colors to match your home or business. Our powder coated aluminum shutters or those built with various fabrics have been Large Missile Impact and Wind Tunnel tested to the highest Miami Dade protocols. 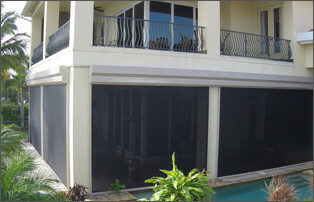 There is not a better solution for protecting your home, property and family than a roll down shutter system from Storm Guard Solutions. 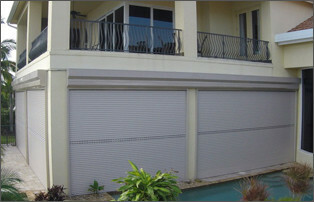 Roll Down Shutters perform many functions. First and foremost is their ability to prevent flying debris in high wind scenarios from breaching the home’s defenses. If that occurs and water and wind are allowed entry the roof may also be blown off leaving the property utterly devastated. What are the Features of Roll Down Shutters?